This was the census where we finally see some Northern movement. Lancashire and Yorkshire now have a (modest) presence, with a couple more in Derbyshire as well. A look at the census records in more details shows that all these families had moved from Shropshire or Herefordshire at some point, although maybe not in the last 10 years. There is now a larger number also in South Wales, with an entry in Pembrokeshire for the first time, and still plenty of Preece families in Shropshire and around the Forest of Dean. 15% of all of these involved in mining name their county of birth as Herefordshire, showing some starting to move away from the traditional agricultural county to new (to them) industries and counties. There are more engaged in iron extraction in this census than any other census year. 1891 sees the South Wales and Midlands "Black Country" mining areas become very clear, with clusters in both regions, very much so in Wales. Groupings can also be seen in the Derbyshire fields, with just a few in Yorkshire and Lancashire in this particular year. 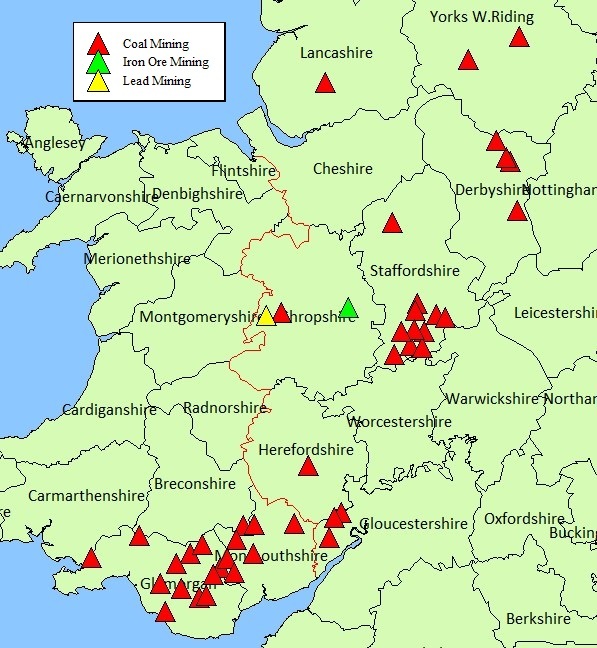 The Forest of Dean still remains active, but the biggest reduction is now being seen in the lead mining in Shropshire, which now remains at only one location, along with an iron mine in the county. Those in the Gloucestershire field are mostly from the county with one or two additions from across the county border in Herefordshire. South Wales has a mixture of those from the counties and from further afield, but again mostly from the nearby counties such as Herefordshire. Staffordshire also has a good number of those from the same county, again showing the slow movement away from the very rural farming occupations which were very prevalent in earlier census and we now see movement to other areas from the county. In total there are now almost 30 men quoting Herefordshire as their birth county, from an overall total for the year around 100, so quite a high percentage. RG12/4352/77 Henry Preece Aberystruth MON 107 Queen Street S 22 Collier Little Birch HEF Border Ann Yemn?